Damas NTAKIRUTIMANA is a 28 year old Tanzanian refugee who lives in the Musenyi integrated rural village in Burundi. After obtaining his humanities diploma, he found himself unoccupied and disoriented until the arrival of the Ideas Box. Soon after the arrival of the Ideas Box, he began spending the better part of the day at the Ideas Box. A registered member for seven months now, Damas affirms that the media center in a kit has changed his life. “Before the Ideas Box arrived, I spent most of my time at the bar drinking or at the ligalas (a meeting place for young people). I was not doing much else and I was not getting along with my family. However, since I started coming to the Ideas Box, my parents are very proud when I explain to them what we do here. According to Damas, the Ideas Box has had an important impact in the social life of the Musenyi integrated village. Before, there was no cohesion between the host and refugee populations. But now, they rub shoulders at the center and some have even become friends. Damas is now the Manager of the youth center in Musenyi. 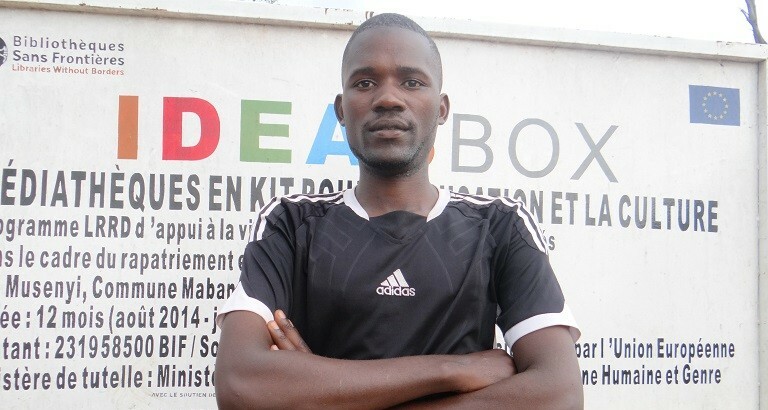 He and four other volunteer facilitators are participating in a training course led by LWB which will allow Damas to take over as Ideas Box Manager in Musenyi. “Many young people here do not know how to use technology. As manager, I am hoping to organize classes to teach young people to become tech-savvy,” adds Damas, who wishes to pass on the skills he’s acquired with the Ideas Box to the future generation.